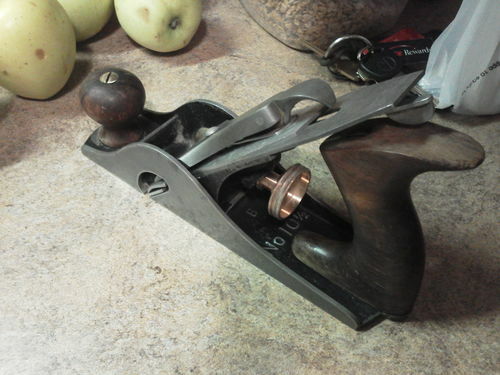 Tools #4: Help dating a Stanley No 10 1/2 "Carriage Makers Plane"
Hey everyone, I’ve been busy with school and still trying to perfect the finish on my desk. 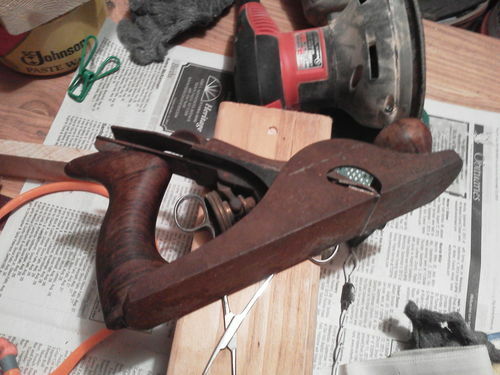 But I took a break to go and see my uncle today I noticed this sitting on the work bench, I told him that I’ve fixed up some planes before and he told me that I could have it. SCORE! 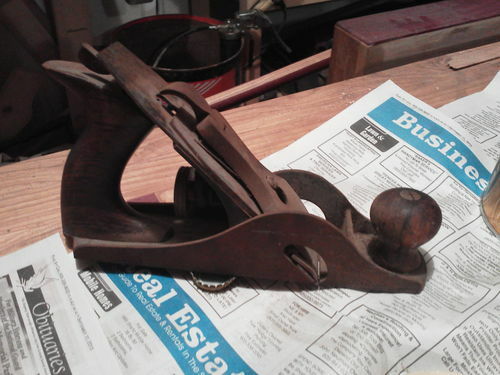 I’m having some difficulty dating this Stanley No. 10 1/2. I’ve been on Patrick's Blood & Gore page and Hyperkitten's Stanley Bench Plane Type Page and I haven’t been able to get it narrowed down very well. Close as I can figure by Hypperkitten’s page is that it is a Type 8 (from 1899-1902) since it has a “B” cast on the body (along with No. 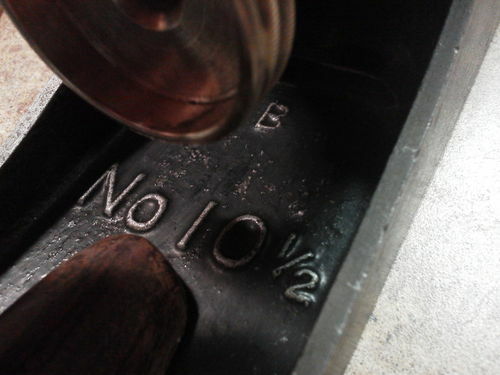 10 1/2) but I do not find a patent date on the lateral adjustment lever, it does say STANLEY, so it is a little conflicting there according to Hypperkitten’s page. 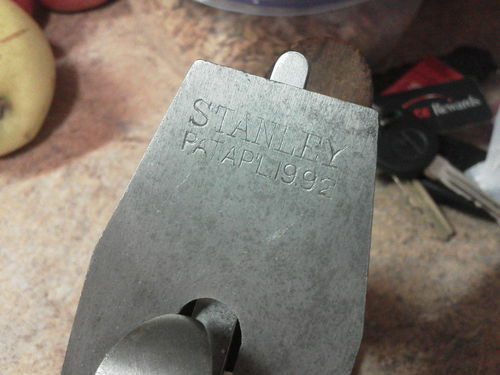 The blade says “STANLEY” “PAT AP’L 19.92”. The man who owned would’ve been about 90 years old, there are initials on the side of it although they are not his initials. Could it really be that old? 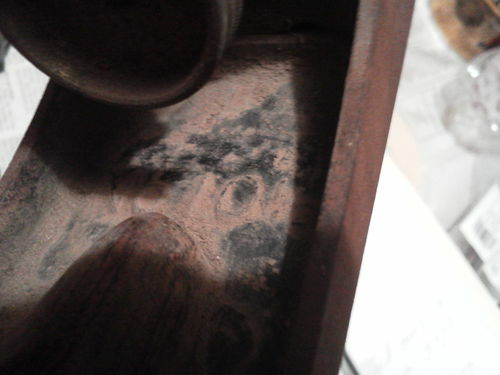 There are no other markings on it anywhere, not on the brass knob, not on the frog, not on the cap. It seems to be in decent shape, I haven’t found any cracks (in the metal) yet but I still need to clean it, the front knob is cracked. Flat head screws. Maybe it’s a different frog that the original on the body? The charts aren’t helping you because they are based on the standard bench planes. Use the logo on the cutter as your guide, that should put it late 1800s. That doesn’t make it a “type 6”, but it gives you a year range. Early 10-1/2 were 9” long. They added 1/2” in the sixties to appeal to the hippies with the long hair. 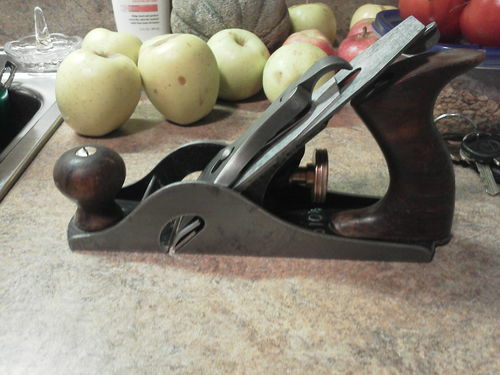 The first model, which I guess would be a type 1, had an adjustable mouth like on some of the block planes. It is super fragile. Unbroken it is worth about $400. Broken it is worth about $2. 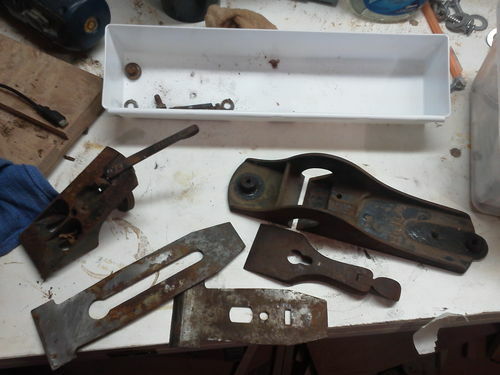 I have the front knob and the adjustable front piece from an early 10-1/2 sitting on my shelf to remind me of that..
Yeah just like Joe said you need to clean the top of the blade off and look for a Trademark on it. But seeing how it has a low knob and a “delicate” tote. I would say its around 1909 or abouts. 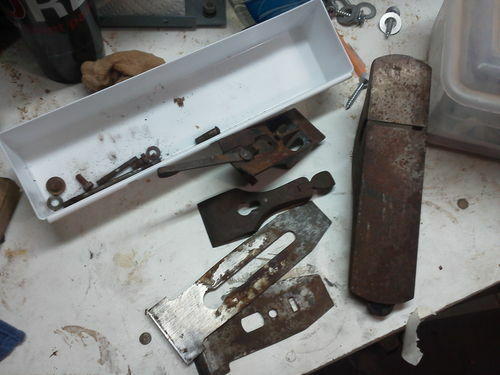 He found the TM on the iron already: The blade says “STANLEY” “PAT AP’L 19.92”. Good points Joe, thanks for the info. I think it’s safe to to say it’s early 1900’s anyways. I’ll have to put a new picture up when I get it shining. Just a quick wash up, lots to do yet. Looks good. Just put some finish on the wood and your rocking.